One of two 'special units' Australia raised during World War Two (with Z Special Unit (/explore/units/581) been the other,) 'M' Special Unit was an Allied special forces reconnaissance team under command of the Services Reconnaissance Department (SRD.) It was the successor of the already highly successful Coastwatchers unit. Raised in Queensland, Australia in 1943 the unit operated behind enemy lines for long periods of time in the Pacific theatre of combat mainly collecting intelligence such as enemy troop movements and shipping details. It was disbanded at the end of the war in 1945. Unlike its sister unit “Z” Special Unit, “M” Special Unit wasn’t well known for hit and run actions against enemy troops. “Z” Special Unit, which comprised 81 members, were generally inserted into their action zones via small boat, submarine or airplane and conducted quick sabotage and intelligence gathering operations against the enemy before retreating. “M” Special Unit on the other hand operated behind enemy lines for extended periods of times to collect intelligence undetected and as such rarely tried to engage the enemy. Following the success of several commando raids in Europe, General Blamey commander of the 2nd AIF suggested that Australia form its own branch of the Special Operation Executive (SOE) in Australia. Generally supported the new organisation was established in March 1942 and became known as the Special Operation Australia (SOA) with the cover name of Inter-Allied Services Department (IASD), usually shortened to ISD. In 1943, the official name of Special Operation Australia was changed to the Services Reconnaissance Department (SRD.) Both “Z” and “M” Special Units fell under its command. 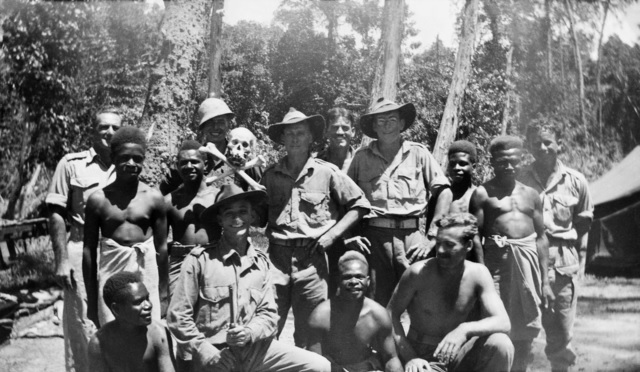 After training on Fraser Island in 1943, “M” Special soon deployed where they operated in both the Solomon Islands and New Guinea conducting intelligence operations against the Japanese. The late 1943 the unit was split into smaller units code named ‘Whiting’ and ‘Locust’ where both units continued to collect intelligence. Generally, a very successful unit the consequences for those captured by the enemy were serve as demonstrated by the most infamous member of “M” Special Unit Sergeant Leonard Siffleet who was executed by Japanese forces via beheading. When the war was won in late 1945, “M” Special Unit was disbanded.